If you’re a writer, there is plenty of love to be found. I might not have quite believed this as Little Miss Angsty-Pants of my high school writer days, but I’ve since grown wiser. It’s easier than ever to have a writing cohort, without even having to leave the comforts of your own squishy chair. Of course, half of the people on Twitter are writers. (The other half are there to stalk celebrities, it seems.) You can start from scratch in there and build up your own writing community, filling it out with the people who encourage your writing. I’ve met some fantastic people, including all my Pitch Party buds that I littered the blog with last week. Make your own group and set up systems for writing and critiquing. Friday Night Writes, a.k.a. 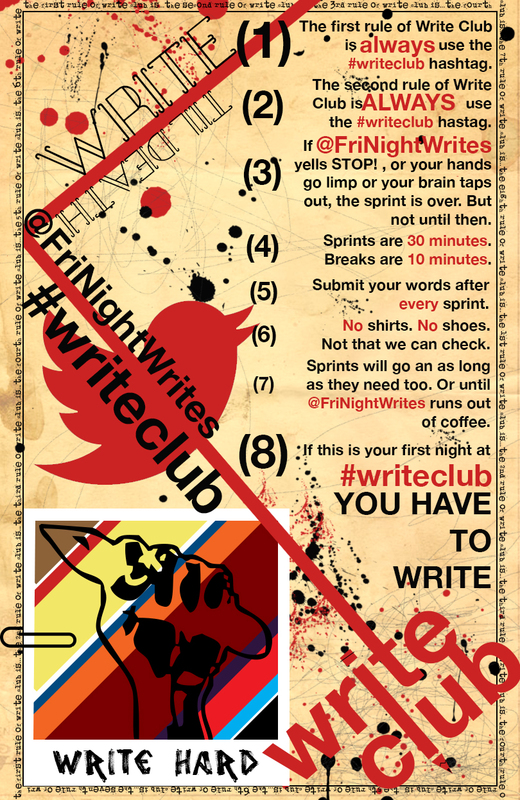 Write Club (@FriNightWrites) Every Friday on Twitter, a beautiful thing happens. For twelve hours and spanning the globe, folks are word sprinting. I don’t know about you, but I get way more writing done in word sprints than I do just sitting at the computer alone. It helps me focus so I don’t get lost down a wikihole or something. Sprints are half an hour each with ten or fifteen minute breaks, and final word counts for the sprint are reported at the end of each one using the #WriteClub hashtag. All those sprints add up in a hurry! National Novel Writing Month (@NaNoWriMo) and Camp NaNoWriMo And every November, another beautiful thing happens- people all over the world write an entire 50,000 word (or more!) novel in one month. A. Whole. Novel. It’s gorgeous, and it’s what kick started my writing more than half a decade ago. It’s also expanded in recent years to include two Camp sessions in the summer. So now you can write THREE novels in the year with this super awesome program. They’ve even got a whole set up for teachers who want to share the love of writing with their classes! Beautiful! Writers Carnival But if you just can’t wait for November or even Friday, there’s a constant party going on over at Writers Carnival! In this site, folks post their writing and critique one another’s work. You’re expected to make three critiques (or at least comments) for every piece you post, so everyone should get a little love. Writer’s have their personal profiles, their list of friends and admirers; you can even post how you’re feeling at the moment. It’s pretty much Facebook for writers. The Carnival constantly has contests with cash prizes going (there are I think four happening right now) and folks there are super friendly. These are just a very few. There are dozens more good ones out there, and if you let your standards slip a bit, the pools widens even more. 😀 But how about you guys? Do you have any online writing groups that make the words fly? Let us know in the comments below!